00:54 – How about a training video with you and Brittany Perillee? 01:30 – How do you get back into lifting after few weeks of a break? 03:54 – What’s your research process when considering a new product for Legion? 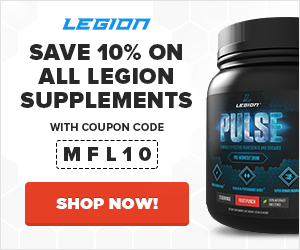 10:53 – I love the mixability of Legion’s Whey but I find it has a slightly bitter aftertaste. Is that because of the stevia? 15:05 – How long does your ab circuit typically take? 16:09 – What is the Stacked beta release date? 19:30 – What do you think of intermittent fasting on weekends while eating at a moderate surplus the rest of the week to keep fat gain to a minimum, and be able to eat out once or twice a day with family/girlfriend and eat almost anything (as long as it has a good amount of protein)? 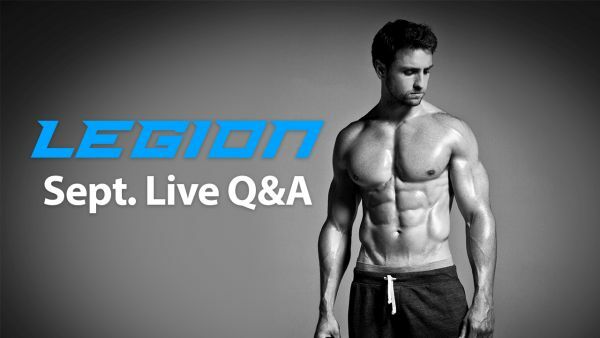 25:50 – Can I train fasted on a bulk diet? Is it a problem for muscle growth? 27:45 – Would you rather be shredded but 5 ft tall, or skinny fat and 6ft 5? 28:42 – Is reverse dieting completely necessary? I know Lyle McDonald simply suggests eating at maintenance for 2 weeks and then bumping up for a surplus. What do you think? 32:30 – As an entrepreneur, how did you develop so much self-discipline and efficiency? 37:22 – Would you substitute cardio with yoga once a week? 38:03 – Any advice on rehabilitation? 43:53 – I train for 5k races and run 5-6 miles a day. Should I increase protein intake to preserve muscle or carb intake to spare protein being used for fuel? 46:03 – How long can I be in a calorie deficit? Is 3-6 months to long? 50:45 – Everyone knows that the maximum NECESSARY protein intake is .82 grams per pound of bodyweight. And if we allocate more than that people say, “That’s TOO MUCH protein!” But what does this mean? What if I LIKE eating protein? What if I weigh 175 pounds but I ENJOY eating 350 grams of protein per day? 55:48 – What do you think of mini-cuts? 55:16 – Any tips for finding someone to train with? 59:24 – In order to make gains one must be in a caloric surplus. Can this caloric surplus be calculated on a weekly basis? 1:01:07 – Do you run into people that tell you how lifting is not healthy and that counting calories doesn’t work? 1:08:08 – What’s your opinion on continuing to taking Forge/Phoenix even while bulking? Wouldn’t the improved insulin sensitivity help with improving the ratio of muscle to fat gained during the bulk? 1:12:32 – Today I ate a protein bar that was horrible…not many are great, as we know. Will Legion be making anything like that? 1:15:53 – If you eat too much sodium, how long does it take to get rid of it? 1:17:39 – At what point does it make sense to start adding in HIIT?